Looking at this sweet face you wouldn’t think she was locked in a carrier abandoned by the side of the Bronx River until someone reported her to the NYC Parks Department. Even though someone was so cruel as to abandoned this helpless animal, a caring Bronxite made the choice to take her home – with her other five pets – and care for her until she finds a good home. Some say no good deed goes unpunished but I believe that one act of kindness leads to another. Let’s extend a helping hand to this Bronxite who dared to care and help find a home for this little overcomer. This friendly cat has adjusted well to home life, even if a bit crowded for now. This sweet little feline of approximately 3.5 year of age is mature enough to show affection without being clingy – then again she may know about not pushing her new found luck. 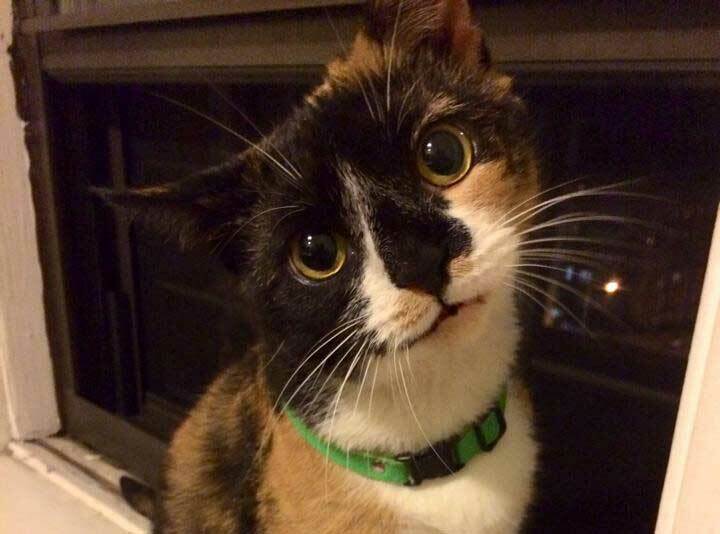 But it is time for this undercat to have a happily ever after of her own, with a loving family that will treasure and nurture her for the unique feline she is. Some say cats have 9 lives, who knows how many lives she’s used up waiting for a family of her own. Don’t allow her to keep wondering!